I’m still working with some wool left over from my Log Cabin Coat. 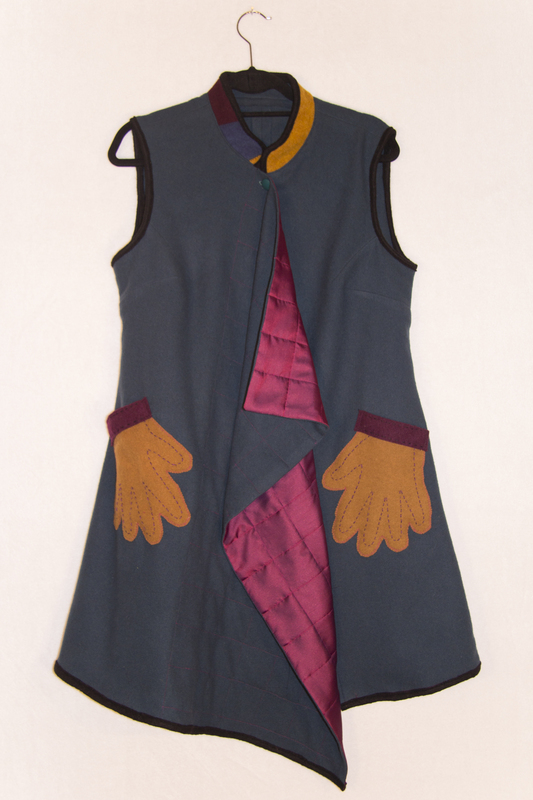 I wanted to make a muslin for a vest and ended up with a finished project. I’m not even sure when I will get to the actual vest planned since I have also been playing with making pullover tops and vests from knit shirts purchased at Goodwill. I’ll show those on a later post. Starting with jacket pattern 6656 from New Look made sense since I wanted to have darts and a closer fit and this pattern has a good basic shape. 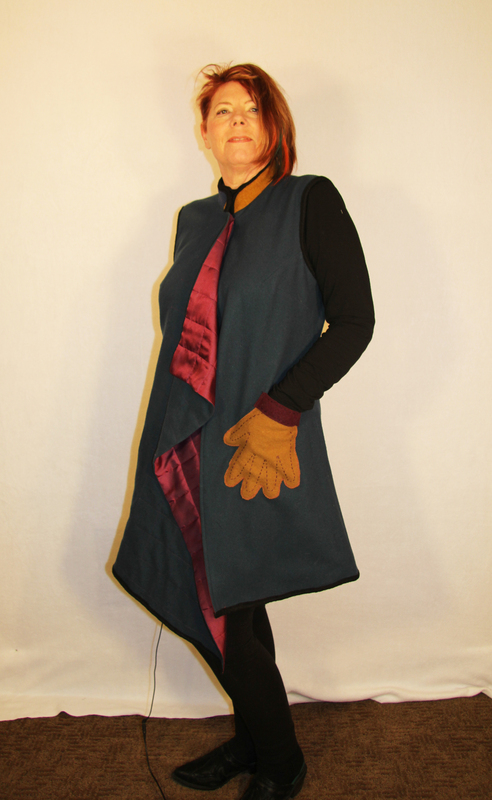 I made so many changes including adding a second dart that not much is left of the original pattern except the collar. I added the bright magenta lining for a bit of punch. 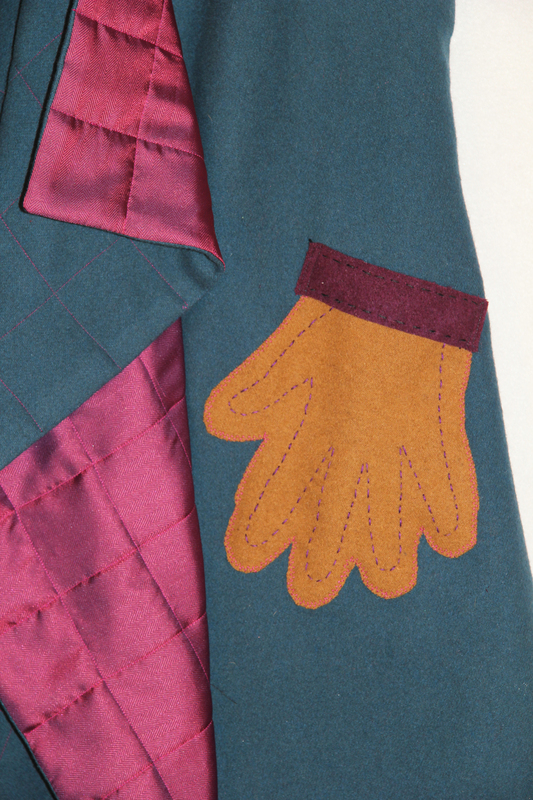 The glove pockets were something that I remember seeing quite a few years ago on a children’s sweater. I love them! I may add a bit more detail in the back, but for now there is at least a little pleat of the magenta lining for a little surprise. I want to make some winter T-shirts that are fun, but functional. They need to be washable, and easy care plus I hope to have pockets on most if not all of them. This is my first T in the series. 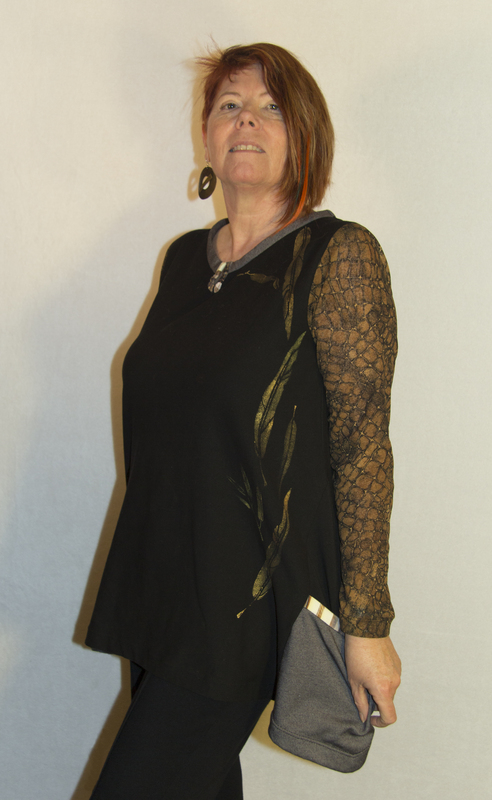 I used Katherine Tilton’s Butterick pattern B5925. This is the first T-shirt I have ever made, but the pattern was easy to follow. I used 4 different knits and stenciled the front. I may add more stencilling later. 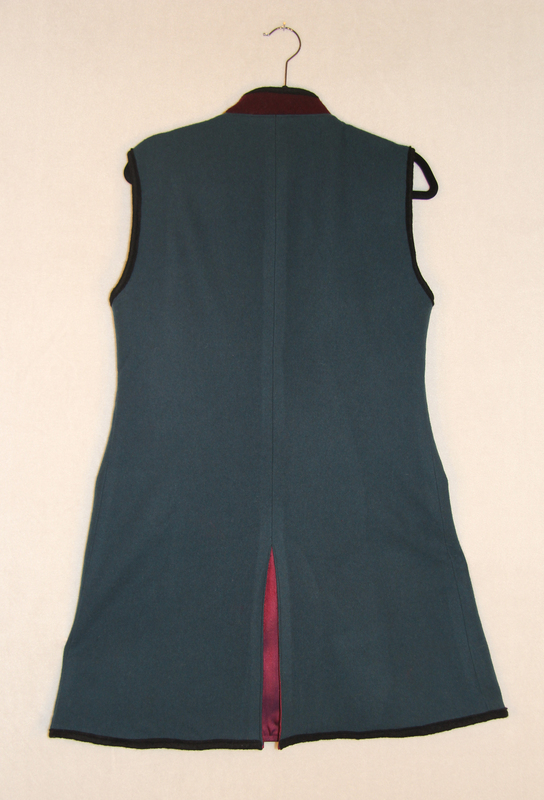 The neck didn’t come out flat due to the lack of stretch in the knit I used for the binding. I call these little mishaps GDO’s (Good Design Opportunities) since they force me to rethink a problem and come up with a creative solution. I keep getting compliments on the keyhole neckline so the solution works well. 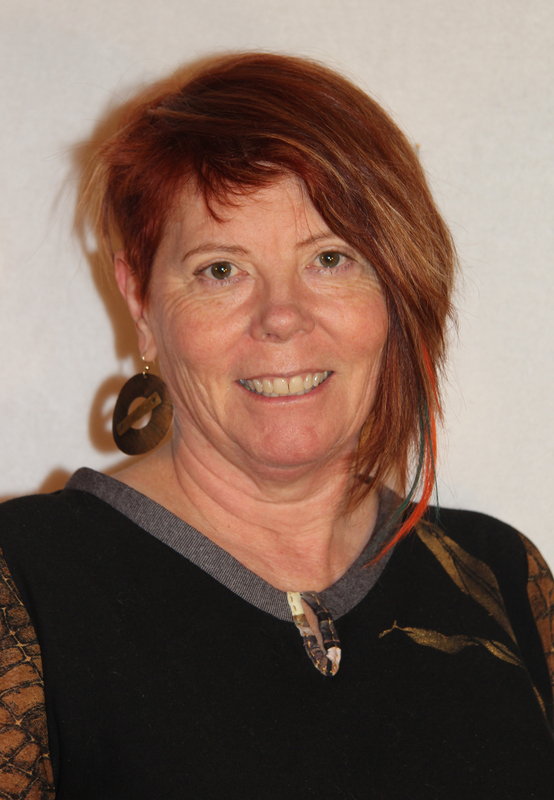 Nancy Shriber was the guest artist at the recent Design Outside the Lines retreat run by Diane Ericson. Nancy, an expert Sashiko artist, showed us fantastic samples from her book Sashiko Handbags 14 on 14. The premise is to make an embroidered 14″ x 14″ lined embroidered square and fold it to form a purse. Think of an origami meets handbag construction. I made her Asymmetrical Envelope with freeform embroidery rather than the traditional geometric Sashiko pattern. 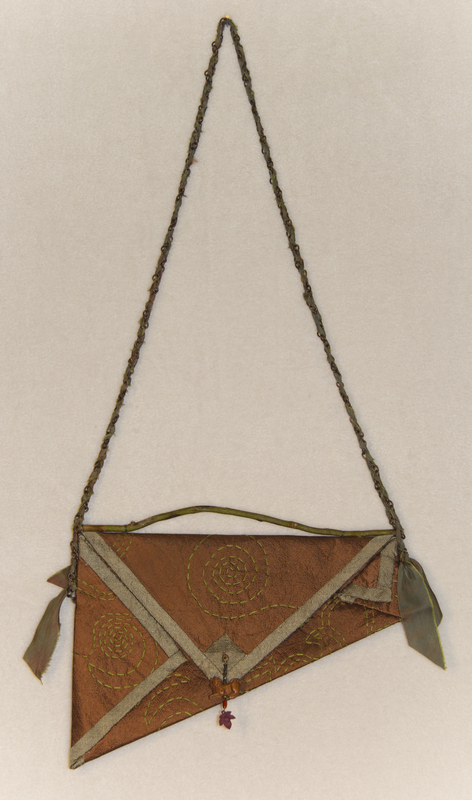 The top has a piece of curly willow to give the bag structure. I braided copper chain with hand dyed silk ribbon for the shoulder strap. 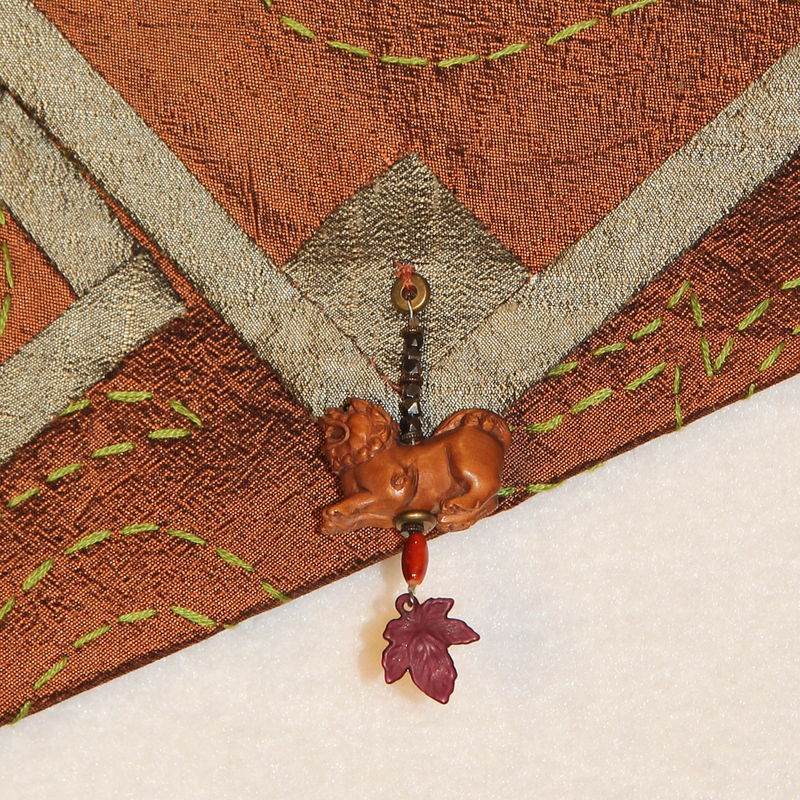 The Foo Dog covers a magnetic snap, and the inside silk lining has a small pocket for a phone or eyeglasses.